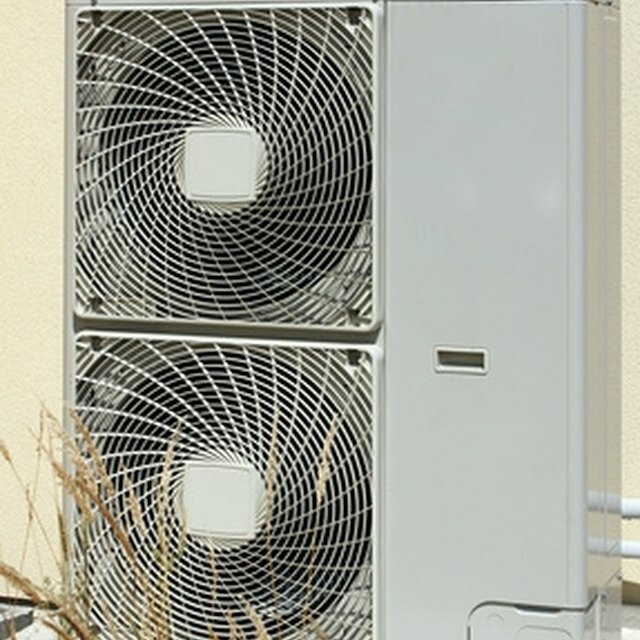 An air-conditioning condenser contains a compressor, fan and coil. The condenser's compressor pumps refrigerant through the condensing unit to the evaporator coil, located in the furnace, and back to the condenser again. The fan pushes air through a condensing coil, over the compressor and out of the unit. The condensing coil receives hot vapor refrigerant from the condenser's compressor and changes it to a cool liquid. The refrigerant transfers heat from inside of the home to the outdoors. Only EPA-certified technicians can legally tap into sealed refrigerant systems and change an air-conditioning condenser. Changing an old condenser can save money on the electric bill. Turn the power to the condenser off at the electrical disconnect box. Follow the wires from the condenser to the disconnect box, usually located within arm's reach of the unit. The disconnect box uses either a circuit breaker type switch or a buss bar to break the electrical circuit to the unit. Connect a set of refrigeration manifold gauges to a refrigerant recovery machine and the condenser using the recovery machine manufacturer's directions. Typically the hoses from the manifold will connect to the refrigerant service ports located on the refrigerant service-valves as they enter the condenser and to the "Vapor" side of the recovery machine. Evacuate the refrigerant from the condenser completely. Failure to purge the system will destroy ozone in the atmosphere. Disconnect the manifold gauge's hoses. Open the condenser's control panel access cover with the correct sized nut driver, either 5/16- or 1/4-inch. The access cover, located on the side of the condenser above the refrigerant lines, provides access to the electrical connections. Disconnect the high- and low-voltage wires coming from the house from their respective connections. The thick high-voltage wires connect to the contactor, a black box-shaped high-voltage relay with a low-voltage coil, with slotted screws that requires a flat-head screwdriver to loosen. The ground wire, from the high-voltage wire set, connects to a grounded terminal block. The thin low-voltage wires use wire nuts to connect to the wires coming from the low-voltage coil on the contactor. Pull the wires from the condenser's control panel. Often a whip, a flexible conduit that holds the high-voltage wires, needs a locking nut removed from the control panel. The locking nut will turn when pried with a flat-head screwdriver. The wires, or whip, will pull straight down from the bottom of the control panel. Cut both copper refrigerant lines with copper-tubing cutters. Cut them as close to the condenser as possible. Move the old condenser from the cement pad on which it sits. Place the new condenser on the cement pad. Rotate the condenser until the refrigeration-line connections line up with the cut refrigeration lines. Push the refrigeration lines into the refrigeration-line connections. Place a wet rag on the service valves to prevent the valves from overheating. Solder the refrigerant lines to the refrigeration-line connections with an oxygen/acetylene torch set. Use a silver-based solder. Place the flame on one side of a valve, and touch the other side with the solder. The silver-based solder will flow to the heat source. Solder one valve at a time. Open the condenser control panel's access cover. Push the wires into the control panel through the hole located in the bottom of the control panel. If the unit uses a whip, then hold the whip in place with the locking nut. Push the high-voltage wires into the condenser's contactor. Tighten the contactor's locking screws with a flat-head screwdriver. Wire colors do not matter. Connect the low-voltage wires from the house to the wires coming from the contactor's low-voltage coil with wire nuts. Wire colors do not matter. Close the control panel's access cover. Secure it with the removed screws. Hook a vacuum pump to the manifold gauges and the refrigerant service ports using the vacuum pump manufacturer's instructions. Basically connect the left and right hoses from the manifold to the condenser's refrigeration service ports and the middle hose to the vacuum pump. Run the vacuum pump until the left gauge on the manifold reads 29 inches of mercury. Turn the vacuum pump off but leave the manifold connected. Hold the vacuum for 30 minutes to check for solder leaks. The vacuum reading on the gauge must not change. Open the refrigerant service valves, with an adjustable wrench or Allen wrench, to release the condenser's self-contained refrigerant charge. Turn the electricity to the condenser on to test the unit. Add refrigerant as needed. How do I Install an Air Conditioner Liquid Line Dryer?